DAKAR (Reuters) - Senegal's main opposition party on Saturday chose Karim Wade as its candidate at the next presidential election, even though a court is about to rule on corruption charges that could put him behind bars for seven years. Wade was a powerful minister when his father, Abdoulaye Wade, was president. The decision by the Senegalese Democratic Party congress raises the stakes ahead of the verdict, expected on Monday, where the prosecution is seeking a seven-year sentence. Wade, who has been in detention since April 2013, won 257 votes of 268 cast at a party congress, although the next election is not due until 2017. 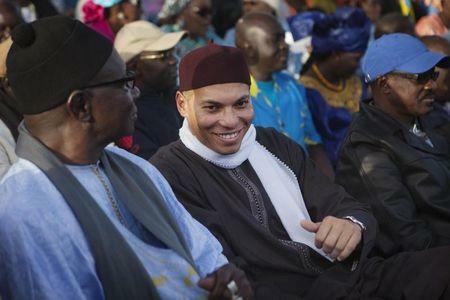 "The fact of choosing Karim Wade is just a way of trying to have an impact on the (court) verdict," political analyst Babacar Justin Ndiaye said. Abdoulaye Wade ruled the West African state from 2000 to 2012 before Macky Sall defeated him in a hotly-contested election. Sall said on Tuesday he would not tolerate trouble in Senegal, which has established itself as one of Africa's most stable democracies.